Last week I received my final university grade, the grade I will be graduating with. I am so happy to say I will be receiving a Second Class Honours (Upper Division) in Media, Industry and Innovation. Considering I stuck by a course I wasn’t particularly enjoying and dealt with a rather challenging individual in my first year (that’s a situation I won’t get into on here), I am so happy to have made it to the end with this grade. The last three years in Brighton have been the best of my life so far, I met my boyfriend, made wonderful friends, became part of (the best) blogging community I could have wished for, and found the encouragement to make this space on the internet something I could be proud of. My experience has taught me many things, my housemates and friends have taught me so much and I have changed a lot over the last three years since I moved away from home for the first time. I thought I would share some of the important things I have learnt. 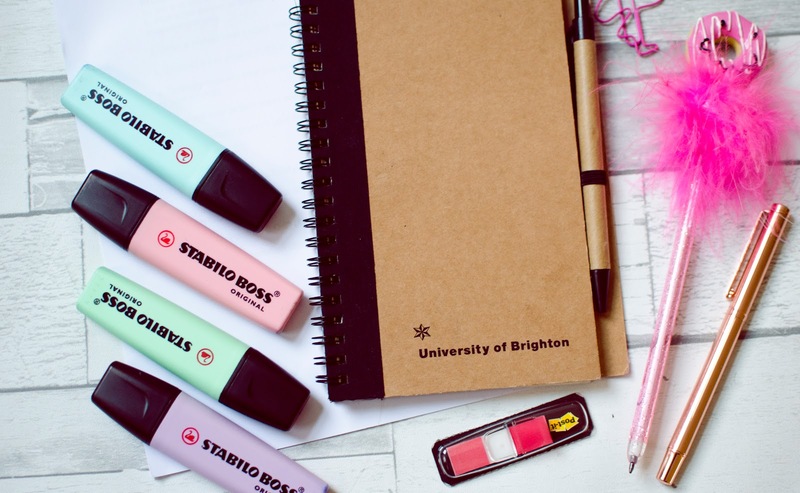 Whether you are about to head off to university, graduate this summer like me, or are still at university, I am sure these are all things you can relate to in the weird and wonderful experience that is university. I feel like this is relevant to everyone as a student, every person you speak to has dealt with a nightmare housemate or annoying coursemate, it just seems to be part of the university package. Honestly, it seems to be more surprising to hear of a house share that all get along by the end of their first year together. While you will inevitably end up meeting people you don’t click with, university gives you the opportunity to meet some of your best friends. I met Sam, who I couldn’t now imagine my university experience without and some wonderful people who I know I will keep in contact with now we have left. So many people throughout my life have told me this and until university, I didn’t truly believe it. Obviously, my university gave me a lot of the opportunities to meet new people, but if you have the confidence to talk to people and network yourself, the opportunities you can get are endless, from internships to grad jobs or just a good contact for the future. I have some exciting things coming up this summer (all will be revealed soon) just from contacts I have made. The number of times I have woken up for a 9am lecture only to be 20 minutes in and realise its an absolute waste of time. Whether the lecturer is reading off a presentation that’s already been uploaded to your university website or no one turns up to teach you, it’s happened to all of us and it’s the most infuriating feeling! This isn’t true for everyone as speaking from experience, the boys I lived with in my first year were completely content in a dull and empty room with not an ounce of colour. By my final year, I was in a house that felt like a home and not a student house as we all made an effort to make it feel cosy. It really made a difference to us all as we were a house that wanted to spend time together in the evenings and use the communal spaces to do work rather than sitting alone in our rooms. Says the girl that took a trip to Prague the month before her dissertation was due in… Okay so maybe that wasn’t the best decision but it was a birthday celebration. Truth is, university is stressful, deadlines can be too much all at once and sometimes absolutely nothing makes sense. It’s important to take time out when deadline season hits. When I have a lot of work to complete, I make sure that I am up early and doing work during the day, usually with other people so it takes the pressure off. I won’t do work past 6/7pm unless I really have too. Which means I then get my evenings to myself to relax and unwind rather than staying up late to meet a deadline. Everyone works differently but this is something that worked really well for me. My part-time jobs kept me financially stable, gave me something to do on days without lectures when others were at university and opened up a new social circle for me. I struggled in my first year moving around a few different jobs and never really enjoying them (I was used to retail but kept getting jobs in hospitality) but by my second year, I had managed to get a contact with Monsoon again. I loved this part-time job when I was in college so I was so happy to be back, but while the money was good and I worked with a wonderful team, sometimes having a job was the worst thing about uni. When deadlines came around I would have to fit going to the library around my shifts and although this easily done it made every working day feel stressful for me as all I could think about while on shift was how much work I still had to complete. This is true for everything but honestly, when I think back to the day my parents moved me up to Brighton, it feels like 5 minutes ago. A university year isn’t a full 12 months, so I think this is why each year seems to feel quicker and quicker, but appreciate all the little things and take every opportunity you are given. I didn’t realise I had completely mastered this until I came home and cooked for my family and the pasta to bolognese ratio was almost laughable… I’m sure I’ll get used to it again soon! Never. You will always regret them when they get posted on Facebook a few days later. I haven’t even been back for my graduation yet. It’s been two weeks since I came back home and all I can think about is being back in my student house, friends living down the road, spontaneous nights out and the freedom of living away from home. Brighton made my university experience unforgettable, which means it’s going to be hard for me to leave it all behind. So, those are just a few of the things that my university experience taught me. I know uni isn’t for everyone but I had the best three years of my life and I am still in shock that it’s finished. Are there any things that you learnt while away at uni? Let me know in the comments!